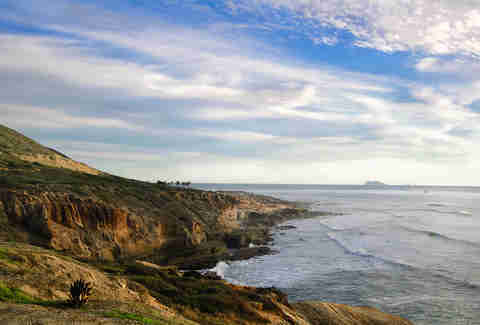 Sure, Torrey Pines is a beautiful stroll along the beach and Mt. Woodson has a rock that looks like a chip, but those are not the only hiking trails worth checking out around here. 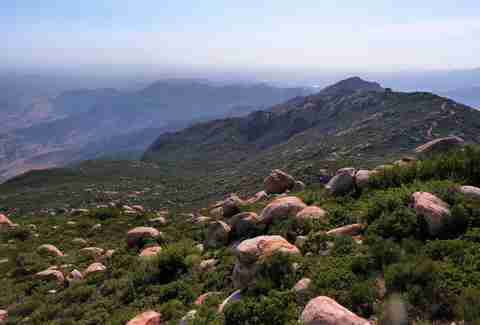 In fact, San Diego has over 100 named peaks and miles and miles and miles of other hiking trails all over the county. So if you’re tired of fighting the crowds while trying to get your hike on at the more popular spots in SD, it’s about time you blaze some new trails. 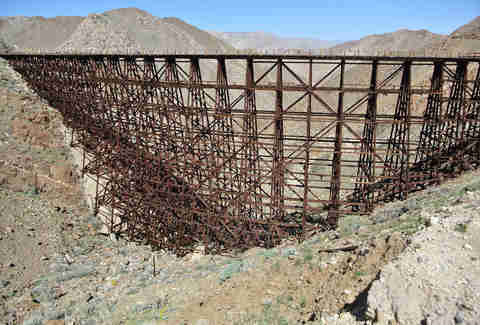 Hidden back in the desert mountains of Anza-Borrego State Park east of San Diego is the largest wooden railroad trestle in the world. This trek is not for the inexperienced hiker and will most likely take you a whole day. The "trail" is not marked or maintained and is pretty much non-existent. You’ll have to do some navigating for this one, so if you don’t have a GPS unit or at least know how to use a map and a compass, don’t even think about marching off into the desert like you’re Indian Jones or something. This hike is intense and involves rugged terrain; bouldering; navigating through brush; and possibly an encounter with snakes, glowing orbs, or the Borrego Sandman. So bring a lot of water, use your common sense, and be prepared for anything. Once you reach the trestle it will all be worth it. We’ve all explored the tide pools with the tourists at Cabrillo National Monument, but at the end of the designated National Park Service trail is where the adventure begins. Tucked away around the corner from the tide pools are hidden sea caves. These caves are only accessible during low tide, so unless you want to drown or be swept off the rocks by incoming surf, timing is everything. If you want to conquer the highest point in San Diego County, then hike to the top of Hot Springs Mountain in the Los Coyotes Reservation. After closing the land to recreational use for years due to destructive visitors, the tribe has re-opened the area to the public on weekends for a small day-use fee. The trail starts at the Los Coyotes Campground and follows an old fire road as the hike takes you through a dense and shady conifer forest. Sitting atop the 6,553ft peak, you’ll find the remains of an old fire lookout and beautiful views in every direction. 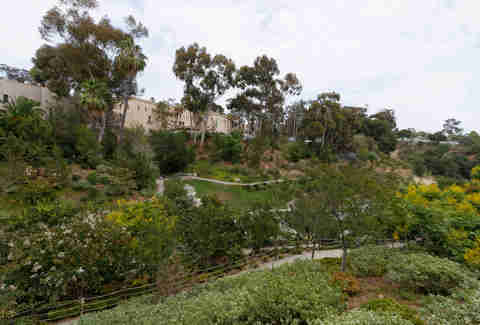 Balboa Park isn’t just full of culture, its also full of hiking trails. If you don’t have time to drive off into the wilderness but still want some exercise in the fresh air, try a little urban hiking. Balboa Park is huge and there are 19 trails at varying levels of difficulty that will take you 65mi through the park. There’s no need to go all the way to Arizona or Utah to experience a slot canyon hike. We have one of our own just east of San Diego in Anza Borrego State Park. There is no trail marker for the slot and it can be tricky to find, but once you’re there you can wind your way through this narrow canyon that was carved into the desert by rushing water. 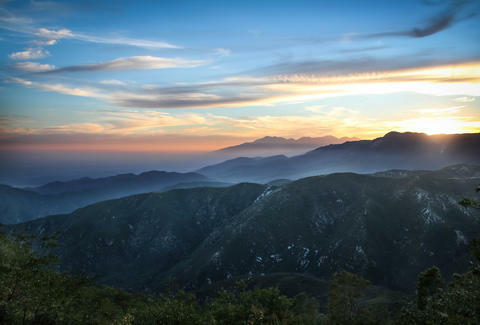 If you’re looking for a good workout with a great view, El Cajon Mountain is for you. Known as one of the most challenging hikes in SD, the trail follows an old mining road that both ascends and descends for most of the way up to the peak at 3,675ft. Which means you’ll be going up and down all the way back down the mountain as well, so expect some burning quads. The trail is closed in August due to extreme summer temperatures, so be sure to bring plenty of water if you want to attempt this trail in the warmer months. Open Space Park has just that, 2,352 acres of open space to explore in the Rancho Peñasquitos area. There are seven or eight hiking and biking trails all over the area, and they’ve just recently added a mile and a half of new trails connecting the two sides of the park from the Glider Port Trailhead to Miner’s Ridge Trailhead.